The objective of this analysis was to identify the causality among variables that originate the highest level of familiness in private family firms. The Bayesian Networks (BN) theory was applied to measure the effectiveness of resources and capabilities provided by the family members within a family business to understand causal relations among variables by using probabilistic reasoning throughout a graphic. Results showed that if salary of family members was higher than salary of employees in the same position, if family members shared information among themselves, and if family firms presented family-employee bonds, there was an 83%, 70%, and 79% of probability of having a high level familiness, respectively. The limitation of the study is that any modification in the BN might show different outcomes. These findings expand the knowledge on family business discipline and suggest a path for family business’ leaders to increase familiness. If family firms want to strengthen their competitive advantage, the main variables they should focus, among all the resources and capabilities that represent familiness, are salaries of family members, sharing information, and family-employee bonds. El objetivo fue identificar causalidad entre variables que generan el mayor nivel de familiness en empresas familiares privadas. Se utilizó la teoría de Redes Bayesianas para medir la efectividad de recursos y capacidades generados por familiares dentro del negocio familiar y comprender la relación de causalidad entre las variables, mediante razonamiento probabilístico y gráficos. Los resultados muestran que si el salario de los familiares fuera mayor que el salario de empleados no familiares, los miembros de la familia intercambian información entre ellos, y existen lazos de familia y empleados, existe un 83%, 70%, y 79% de probabilidad de lograr un nivel alto de familiness, respectivamente. La limitación del estudio es que cualquier modificación a la red podría generar resultados distintos. El estudio aumenta el conocimiento de las empresas familiares y ofrece alternativas para que líderes de estas empresas incrementen el familiness. Si las empresas familiares desean fortalecer su ventaja competitiva, las principales variables por las que deben apostar, de entre todos los recursos y capacidades que representan familiness, son salarios de los familiares, intercambio de información y relaciones familia-empleados. A popular concept studied in the family business discipline is familiness, the unique bundle of resources and capabilities a particular organization possesses because of the family firm system’s interaction among the family, its individual members, and the business (Habbershon & Williams, 1999). This concept is a very important one to understand the difference between family and nonfamily firms, because it considers the influential elements generated by family members for their organizations’ performance. Even though the concept was first introduced almost 20 years ago, it has received some critics because it lacks proper scales or models that can help family business’ leaders to make decisions related to professionalize their firms. The focus of the present study includes small and medium private firms, mainly family business. Developing studies or new theoretical models for private companies might have a stronger impact in the economic reality of countries because small and medium private companies are the most common type of businesses around the world and the ones that lack resources to access corporative knowledge and require more support from academic disciplines to implement new strategies to succeed in a highly competitive business environment. In this paper the Bayesian Networks theory was applied to measure the effectiveness of the resources and capabilities provided by the family members within a family business. The objective of the analysis was to identify the causality among variables that originate the highest level of familiness. In the discipline of family businesses, it is common to find researchers asking the question whether family firms perform better than non-family firms. Even though it has been proved that public family businesses perform better than public non-family businesses (Allouche, Amann, Jaussaud, & Kurashina, 2008; Anderson & Reeb, 2003; Gueye & Simon, 2010; Le Breton-Miller & Miller, 2006; Martínez, Stöhr, & Quiroga, 2007; Martin-Reyna & Duran-Encalada, 2012; Sharma & Carney, 2012; Stewart & Hitt, 2012), this reality is not the same when comparing private family business versus private non-family firms in which the later have presented better performance (Martínez, Stöhr, & Quiroga, 2007; Sharma, Chrisman, & Gersick, 2012; Stewart & Hitt, 2012). One explanation could be that these firms do not have the necessary resources and knowledge to perform better than private non-family firms (Ramírez-Pérez, 2016). Although it might be interesting to learn more about this phenomenon and to find out better alternatives to professionalize private family firms, the reality is that over 80 percent of researches in family business have focused their studies on publicly traded companies because they provide an easier access to reliable date (Sharma & Carney, 2012). Having more studies on private firms, should not seek the goal to keep analyzing whether private family firms perform better than non-family firms; the appropriate question one should ask is which types of family firms lead to higher performance (Dyer, 2006). A method developed by all types of organizations to boost their performance has been to strengthen their strategic planning capabilities; this path might be also followed by private family firms regardless of their size. Strategic planning typically refers to the process of developing a business strategy for profitable growth (Ward, 1988). For more than two decades, during the 1960s and 1970s, organizations followed strategy execution according to Chandler (1962) in which the implementation of the strategy was simplistically reduced to a structural or architectural view of the organization, through the principle of structure follows strategy (Chandler, 1962). Years after, researchers concluded that, although structure is an important vehicle to strategy execution, it is not the only one. Other alternatives, such as resource allocation processes, performance evaluations, and reward systems (Bartlett, 1983) constitute the form of the organization (Harris, Martinez, & Ward, 1994). Those researchers showed that strategy execution required something more than only good structure, but it also needed elements to be put together to create a competitive advantage that places the firm apart from other firms. Therefore, the strategic goal for a company, small or big one, is to build a sustainable competitive advantage (Harris, Martinez, & Ward, 1994). According to Barney (1991), firms obtain sustained competitive advantages by implementing strategies that exploit their internal strengths, through responding to environmental opportunities, while neutralizing external threats and avoiding internal weaknesses. Habbershon and Williams (1999) mentioned that strategic development of a firm comes from internal processes that allow the creation of competitive advantages. Competitive advantages do not come from external elements, but from internal ones, such as resources and capabilities that each company learns how to put together to create some competitive value for the company. Resources and capabilities are the main elements that build a competitive advantage which refers to the implementation of a value by a firm that is not simultaneously being implemented by any current or potential competitors (Barney, 1991). A well-recognized theory with which to study a competitive advantage as a main element for strategy is the Resource-Based View (RBV) that explains long-run differences in firm performance that cannot be attributed to industry or economic conditions (Habbershon & Williams, 1999). A Resource-based framework for strategy analysis is presented in Figure 1 (Grant, 1991). When referring to strategy execution and competitive advantage creation, there are no different methods for family businesses and non-family businesses because the resources and environment that have to compete successfully are essentially the same for all firms competing in the same markets (Chua, Chrisman, & Bergiel, 2009). However, family businesses present one important difference among their resources and capabilities that non-family business lack: familiness, an influential resource that nonfamily businesses do not have that strengthens or weakens the competitive advantage. As defined by Habbershon and Williams (1999), familiness is the unique bundle of resources and capabilities a particular organization possesses because of the family firm system’s interaction among the family, its individual members, and the business. Performance research on private family firms should focus on identifying a firm’s familiness and assessing its impact on the company’s strategic capabilities, rather than assess how family businesses may or may not have a competitive advantage (Habbershon & Williams, 1999). A new framework of the RBV including the concept of familiness was created by Habbershon and Williams (1999), adapted from the model created by Grant (1991) in order to study family businesses settings (Figure 2). Source. Habbershon and Williams, 1999. In a family business context, the model presented by Habbershon and Williams (1999) sought to determine whether family members represented a competitive advantage to the firm because of the resources they provided, as a family or individually. Family members, just by working in the organization already offer resources in the form of familiness, however the involvement and influence of a family in a business does not automatically lead to familiness (Weismeier-Sammer, Frank, & von Schlippe, 2013). The goal should be to find the most effective combination of resources offered by family members that would have a better impact on performance (Ramírez-Pérez, 2016). Ramírez-Pérez (2016) found that when family business’ leaders increase their awareness of the gap between the real resources and capabilities the company has, given by their family members versus the resources and capabilities business’ leaders believe an “ideal executive” should have, those firms would tend to demand better results from their family members. This situation would lead to create a better familiness environment which was found significantly correlated with business performance (Ramírez-Pérez, 2016, p. 179). The suggestion made by Ramírez-Pérez (2016) was that by understanding familiness in private family firms, these companies would improve their performance. Weismeier et al (2013) suggested as essential to consider familiness in the light of the three main approaches of: components of involvement, essence, and organizational identity. ‘Components of involvement’ focuses on degrees of family management, ownership, and control; captures the presence of the family in the firm. ‘Essence approach’ focuses on behaviors and synergistic resources contributed to the business by the family; captures how family members behave in the firm. ‘Organizational identity’ focuses on family firm identity which is unique given the idiosyncrasy of the family; captures how the family defines and views the firm (Zellweger, Eddleston, & Kellermanns, 2010). After Habbershon and Williams (1999) first introduced the concept of familiness, the term has been developed by many other researchers. Even though the concept has growth in popularity for analyzing resources of family members, the topic has also received some critics from many other researchers that consider the concept as an umbrella term, because it is still ambiguous and lacks of proved models (Weismeier-Sammer, Frank, & von Schlippe, 2013). According to Weismeier et al (2013) the literature search revealed four theories that have been employed to discuss familiness: (1) the resource-based view, (2) social capital theory, (3) systems theory, and (4) agency theory. These authors found that even though literature review “has become much more differentiated in terms of theories and the methods employed, it also shows that some of the theories used in familiness research have certain deficiencies, which frustrate the development and explanation of this key phenomenon of family business” (p. 172). In spite of the lack of proper measures and scales to fully understand familiness, it seems the most popular method is still the RBV because it enables scholars to define resource categories or the capabilities resulting from them, although it is difficult to uncover the underlying processes that lead to competitive advantage (Priem & Butler, 2001). Before disregarding the use of RBV methods to define familiness, Weismeier et al (2013) proposed that a wide-reaching, solid theory needs to be applied in order to overcome these shortcomings. Before familiness can be measured accurately, emphasis needs to be placed on theoretically solid development of familiness (Rutherford, Kuratko, & Holt, 2008). One alternative to keep advancing in the creation of a familiness scale is the one presented by Frank et al (2016): the Family Influence Familiness Scale (FIFS) comprising six dimensions: (1) ownership, management, and control, (2) proficiency level of active family members, (3) sharing of information between active family members, (4) transgenerational orientation, (5) family-employee bond, and (6) family business identity (Frank, Kessler, Rusch, Suess-Reyes, & Weismeier-Sammer, 2016). Before that study, no measures of familiness in terms of a sound scale development process had been generated. This scale aimed at sharpening the concept of familiness and improving our understanding of family businesses as unique entities and integrated the three approaches of involvement, essence, and identity presented by Zellweger et al (2010). The FIFS is based on new systems theory (nST) that combines two coupled systems (family and business) to measure how a business family influences the structures of the business via decision premises. Based on this coupling, the family is able to influence the business and vice versa. The scale on nST “enables us to overcome some of the challenges of the resource-based view when it comes to defining, identifying, and measuring firm-specific resources” (Frank, Kessler, Rusch, Suess-Reyes, & Weismeier-Sammer, 2016, p. 3). NST goes one step forward over RBV which states that almost anything can turn into a resource due to the broad definition of resources and there might be an unmanageable number of factors to be taken into account when defining the competitive advante of a business. NST considers communication as the basic element of a social system; when referring to familiness, the central elements of the nST are communication and communicated decisions in the form of decision premises: “From n nST point of view, we define a family business as a communication system incorporating the decision premises shaped by a family with at least two family members actively involved in the buisness to enable business-related comunication” (Frank, Kessler, Rusch, Suess-Reyes, & Weismeier- Sammer, 2016, p. 4). A Bayesian Network (BN) is a diagram that represents the domain of decision variables, quantitative and qualitative relations between them, and their probabilities. In other words, one BN allows understanding causal relations among variables by using probabilistic reasoning throughout a graphic; at the same time the quantitative and qualitative components permit to add subjective elements for analyzing different scenarios. Hence a BN is one direct representation of the real world and not a way of thinking. A BN is mainly used for inference by calculating conditional probabilities given the information available at each moment for each node (beliefs), by assigning weights and probabilities of occurrence on each event. The nodes represent variables of relevant interest for the analysis and the edges stand for causal relations or influence links between variables (Madsen & Kjærulff, 2013). Each node is associated with a probability table, as well as a statistical distribution or a parameterized function. In the case of a probability table of the node, the relation is governed by a set of conditional probability values that model the uncertain relationship between the node and its parent nodes, along with any uncertainty existing in that relation. The theory behind Bayesian networks combines Bayesian probability theory and the notion of conditional dependence to represent causality between variables. Its main advantage is to allow reasoning under uncertainty, combine an intuitive visual representation with a mathematical basis of Bayesian probability, and to articulate dependencies between different variables and systematically propagate the impact of the evidence on the probabilities of uncertain results (Neil, Fenton, & Tailor, 2005). The key to a successful design of a BN is to achieve a significant decomposition of the domain of the problem into a set of causal or conditional propositions. The divide and conquer principle is applied and partial model specifications that are themselves significant in the expert domain are taken (Chonawee, Kenyon, & Heusler, 2006). An expert is a person whose experience and knowledge on the analyzed phenomena allows him or her to make sufficiently credible conjectures about how the defined variables impact on the ultimate result. At first the expert’s opinion can be used as a substitute for data and can provide valuable information as well as validate available data so it can be used on the BN. The modeler's challenge is to correctly incorporate those inputs into the model. Subsequently, the node probability table is modeled for each variable, which can be done using historical data or only by asking an expert to provide a series of subjective estimates, which will be ideally based on knowledge and experience (Cowell, Dawid, Lauritzen, & Spiegelhalter, 1999). Once the Bayesian network is constructed, it can be executed by means of an appropriate propagation algorithm. When the Bayesian network is implemented, the effect of data used into one or more nodes is spread throughout the network in any direction and the marginal distribution of the nodes set is updated. This makes the model ideal for a scenario analysis. To define a domain for the problem and the purpose of the network. To select important variables as nodes for the problem domain. To identify interrelations between nodes or variables and represent them graphically. To validate the model with the experts on the subject until consensus is reached so initial values are set. To quantify the network by incorporating expert opinion. To create feasible scenarios with the network and keep it up-to-date. For this study, a survey was used to gather information about resources and capabilities provided by family members in the organization (familiness). The personal information requested from 139 respondents included age, gender, and academic degree. The 46 items from the questionnaire were subjected to content validity testing by a jury of experts made up of Spanish speaking people related to an environment of family businesses. The survey was created using QuestionPro, a software that allows subjects to answer online and that guarantees participants’ anonymity and confidentiality. The first and most important step to collect data and to distribute the survey was the contact of three sources: (a) the President of the Chamber of Commerce, (b) the President of the Board of Industrial Chambers, and (c) the Dean of the College of Business form the private university. The three of them agreed to support the research and provided contacts within their organizations to distribute the survey. The request consisted of sending a message to their databases, specifically to the businesses they knew where family businesses. The message was directed to the CEO or the owner and requested his or her support in completing the survey and then, to ask other people from their company each to complete the questionnaire, including one or two family members working in the organization and to two or three non-family employees. The follow-up was scheduled every week, and participants knew that each survey had to be completed individually. Q12 Characteristics an ideal executive should have. Q13 Characteristics family members working in this business should have. In order to carry out the structure of the model, it was necessary to define the domain of the network, which consisted of designing a model that allowed private family businesses to predict the effectiveness of the resources and capabilities provided by family members. The next step was to identify the important variables or nodes, a substantial part of the network design; this implied for the total knowledge of the familiness process to be able to decompose it in all its phases to select the nodes and to establish the relationships among them. With the variables selected, the graphical model of the causal relationships was designed obtaining a network with three parent nodes and four child nodes to measure the variable of interest: familiness. The resulting relations are plotted in Figure 3. After the creation of the Bayesian Network, the next step was to validate the model with the commission of experts in family business administration. In the following subsection the interrelation among the nodes will be described as well as the a priori probabilities assigned based on database, and propagation of the model is performed to obtain the a posteriori probabilities and hence to establish a measure of familiness. The database taken to consider these nodes was a study performed by Ramírez-Pérez (2016). In this study, a set of resources and capabilities were defined by family firms’ leaders who expressed a list of items an ideal executive should have to succeed in top management positions. Then, the same family firms’ leaders measured the family members working in their organization to define familiness and the gap between their level of familiness and the level of an ideal executive. To quantify the BN is important to keep in mind that each node in the network has associated a conditional probability table which determines the interrelation level of the nodes. These probabilities were constructed from database information obtained from a set of 139 family businesses (Ramírez-Pérez, 2016) and expert’s validation of database. Adjusting a distribution consisted of finding a mathematical function that correctly represented the statistical variable. For an adjustment of distribution functions, the frequency distribution of the historical data must be plotted to propose a distribution model. The most frequent distribution for the adjustment of frequency variables was the Poisson as is commonly used where occurrence frequency is not constant over time, however, the Binomial, Exponential, Binomial negative, and Weibull distribution were also used (Bühlmann & Gisler, 2005). Estimates were made to find the best parameter; tests were performed to evaluate the quality of the fit and finally to identify the distribution. To test the goodness of fit, statistical techniques such as the Pearson Chi-square test and the Kolmogorov-Smirnov test were employed. The distribution that best fit the data used to provide the probabilities on each node was an exponential distribution as is shown with the continuous line and the X 2 test verified it (Figure 4). The dotted line shows the accumulated frequency. Family Influence on Business Property from question 7 of SQ. Management Board from questions 3 and 7 of SQ. Salary from question 26 of SQ. Progress within the Business from question 19 of SQ. Sharing Information Among Family Members from question 9 of SQ. Family-Employee Bond from questions 7 and 9 of SQ. Family Business Identity from question 28 of SQ. Based on the distribution of the frequencies in the answers to the above questions described, the a priori probabilities were constructed for each of the BN nodes. With that information, the graphic model was defined; calculations of the diffusion on interactions between nodes, their weights, and the associated probabilities were carried out. Performing the process manually is extremely laborious so the GeNIe software was used to feed the nodes and to start the calculation process. The BN was ready to model Familiness, the effectiveness of the resources and capacities provided by the family members and to know the current state of the company using the a priori distributions for each node and propagate the information to obtain the probabilities a posteriori.Figure 5 shows the a posteriori probabilities after the propagation. Under this scenario, a 53 percent of influence on business property from one family, a 44 percent of influence on business property from more than one family, a 3 percent of in influence on business property from external participation, a 71 percent of family business identity, 29 percent of none family business identity, 74 percent of management board controlled by family members, 26 percent of management board not controlled by family members, 56 percent of higher progress within the business, 17 percent of equal progress within the business, 27 percent of less progress within the business, 55 percent of family-employee bond existence, 45 percent of family-employee bond none existence, 34 percent of a higher salary, 26 percent of equal salary, 40 percent of less salary, 95 percent of sharing information between family members and 5 percent of no sharing information between family members causes a high level of familiness in 77 percent of probability; causes a medium level of familiness in 16 percent of probability and causes a low level of familiness in 7 percent of probability. These results were considered as a base scenario to perform the scenario analysis presented in the following section. One of the great advantages of a BN is the ability to perform calculations of new scenarios. For this research it was relevant to measure the impacts of the main variables with greater susceptibility to be changed in the short term as a business decisions to generate more familiness. A very flexible variable a business has is salary; therefore it was the first variable analyzed. If average salary of family members were higher than average salary of employees in the same position, familiness increased considerably (Figure 6). Figure 6 Graphic model of higher salary scenario. Ceteris paribus all variables, except salary, the results indicated an increase of 6 percent of probability of increasing familiness. It is important to emphasize that modifications in the salary variable implied an exogenous shock, therefore it did not have direct relation with the immediate superior node, and that is the reason that in the graphic model the arc linking them disappeared. Hence, this condition will happen every time a variable is modeled by a controlled value. On the other hand, if average salary of family members were less than average salary of employees in the same position the probability of familiness decreased in 7 percent (Figure 7). Figure 7 Graphic model of less salary scenario. When considering that sharing information among family members presented a high probability of occurrence, then the probability value for a high level of familiness was 70 percent (Figure 8). Nevertheless, if there was no probability of sharing information among family members, then the probability value for a high level of familiness was 20 percent (Figure 9). Figure 8 Graphic model for a certainty probability of sharing information among family members. Figure 9 Graphic model of none probability of sharing information among family members. Regarding family-employee bond, when this variable presented 100 percent of probability of occurrence, then the probability value for a high level of familiness was 79 percent (Figure 10). However, when there was no probability for having a family-employee bond, then the probability value for a high a level of familiness was 74 percent (Figure 11). Figure 10 Graphic model for the existence of family-employee bond. Figure 11 Graphic model for absence of family-employee bond. Modifications were made in the behavior of the probabilities for the rest of the variables that composed the BN; however they were not presented in this investigation because their impact was not significant in the measurement of familiness. They did not represent in any of the scenarios percentage variations with respect to familiness or they were less than 1%. This study proposed a new model directed to private family businesses with the aim to increase the understanding of the family business’ leaders regarding their own firms. If knowledge generated by the family business discipline boosts the performance of small and medium organizations, the economic impact might be higher because these firms represent the majority of business around the world. As stated by Dyer (2006) having more studies on private firms, should not seek the goal to keep analyzing whether private family firms perform better than non-family firms; the appropriate question one should ask is which types of family firms lead to higher performance. The model was based on resources and capabilities in family firms generated by family members, called familiness which is an important difference family firms have versus non-family business. The interest was to confirm the suggestion from previous researches that sought to determine whether family members represent a competitive advantage to the firm because of the resources they provide, as a family or individually (Habbershon & Williams, 1999) and to find out the most effective combination of resources offered by family members that might have a better impact on performance (Ramírez-Pérez, 2016). The results of this research showed that the most influential elements that impacted familiness were the salary paid to family members versus non-family employees, the existence of bonds between family and employees, and the sharing of information among family members. 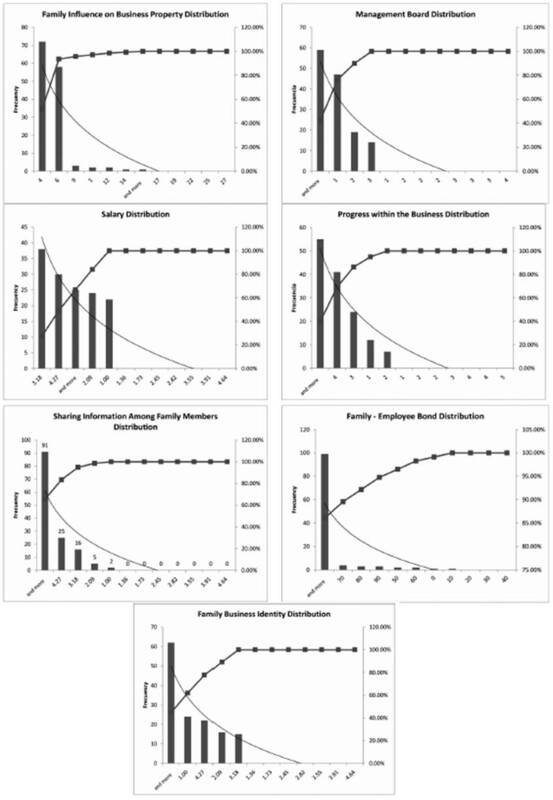 These findings expand the knowledge on family business discipline and suggest a path for family business’ leaders to increase familiness: if family firms want to increase the resources and capabilities that will create a stronger competitive advantage, they should focus their efforts on the salaries paid to family members, increase the bonds between the family and the employees, and strengthen the information sharing dynamic among family members. According to the model, other elements such as the ownership and management presence of family members, the family identity, and the progress of family members in regards to other nonfamily employees will not have a significant impact on familiness. As suggested by Habbershon and Williams (1999), performance research on private family firms should focus on identifying a firm’s familiness and assessing its impact on the company’s strategic capabilities, rather than assess how family businesses may or may not have a competitive advantage. Furthermore, according to the model, the variable with the strongest impact to familiness is sharing information among family members. When information exchange among family members is present the level of familiness reached 80 percent, on contrary, when information sharing was absent, the level of familiness dropped to 20 percent. This finding was aligned to the new Systems Theory (nST) presented by Frank et al (2016) in which it was mentioned that communication was the basic element of a social system. Especially when referring to familiness, the central elements were communication and communicated decisions in the form of decision premises. This research agreed with Frank et al (2016) that the nST represents a superior alternative to analyze familiness over the popular resource-based view approach which lacks of proved models, and when referring to define, identify and measure firm-specific resources. Future research should analyze the relationship of familiness and performance and follow-up the suggestion made by Ramírez-Pérez (2016) that by understanding and expanding familiness in private family firms, these companies might improve their performance.